Enjoy a trendy yet functional dining area with this pub table. 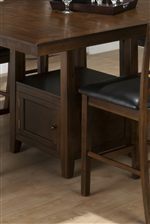 The spacious table top and sturdy pedestal base is constructed from Oak Veneer and Solid Asian Hardwoods in a rich Olsen Oak finish. Tapered feet support a large storage cubby, perfect for storing dining accessories or table decor. Pair with the matching counter height X-back stool for the complete set. 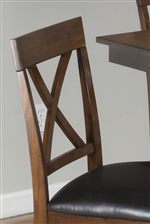 The Olsen Oak collection is a great option if you are looking for Casual furniture in the area.